Risoul and Vars, two sister resorts with a hint of the South, share a vast larch forest with a backdrop of entwined peaks. Their combined ski areas satisfy the demands of skiers avid for wide open spaces and ready to do battle with the mountains. mountain ranges from the Alpes Maritimes to Haute-Savoie, from the Massif des Ecrins to the Queyras, from Mont Viso to Mont-Blanc. Located right in the heart of the Guillestre region, this ski area is above all true mountain country with loads of potential for winter sports enthusiasts. 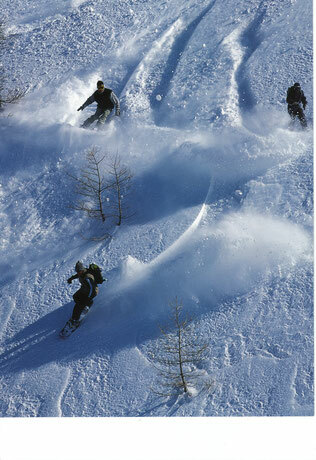 Enjoy 185 km of pisted ski runs in the best conditions. 52 ski lifts - 31 draglifts,19 chairlifts, 1 “télénacelle” bucket lift and 1 gondola - access the whole Forêt Blanche ski area, a total of 116 pistes (21 greens, 45 blues, 40 reds and 10 blacks) .